The problem with UFOs disguised as mansions is that there’s always a few pesky earth folk to come around and disrupt matters. Dan Chameroy kills it as the legendary Frank N. Furter in the wild and wacky musical that’s more raw, riotous and relevant than ever before. 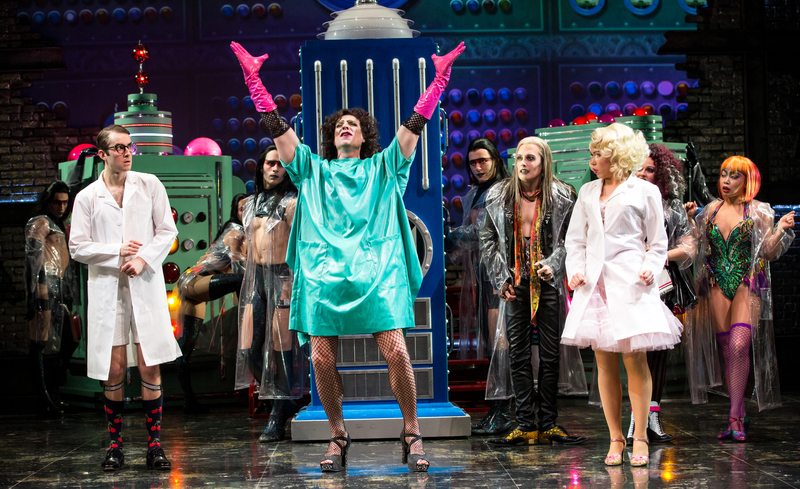 The Stratford Festival’s perfect presentation of The Rocky Horror Show plays the Avon Theatre until November 11, 2018. Regardless which side of the fence you sit on when comes to the ongoing debate as to what the right way is for a theatre company to stage a cult phenomenon, when it comes to one hit wonder Richard O’Brien’s mischievously amusing musical about a stranded couple’s enigmatic encounter with creepy manor dwellers the simple rule is this: It has to be smashing, it has to be spectacular and it has to relentlessly ignore the rules of conventional theatre. For this reason alone, be sure to take a road trip to Stratford this summer so not to miss the manically mischievous event that not only broke the musical mold but went on to prove it was more than four decades ahead of its time when it seized the stage and screen. Oh yes, the faithful and devoted are in fine form throughout the venue and although props are available there is a respectable warning thou shall not toss toast or rice at the players. A favourite fun past-time is a favourite fun past time, of course, but no one’s laughing when an ACTRA performer loses an eye! From a culture context, The Rocky Horror Show was storyteller and music maker Richard O’Brien’s lampooning of bad drive-in sci-fi when he sat down to craft his theatrical and filmic revolution. Little did he know he’d go on to cultivate an iconic singing and dancing legacy that would reach a critical mass of followers throughout the generations. Erica Peck’s aurally escalating ‘Science Fiction’ is the kindle number that Robert Markus’ ‘Time Warp’ packs down for maximum musical combustion. Yet it’s Dan Chamroy who ignites a bonfire of vanity as Frank N. Furter, a role it seems he was destined to land all his life. When it comes time for him to belt out ‘Sweet Transvestite’, don’t be surprised if you’ll find the sudden urge to scoop up a pair of fish net stockings on the ride home. Taking liberties to update the musical wherever Donna Feore sees fit, in doing so the director secures a fabulously fun, deliciously devious production that hits maxim thrill overdrive to give audiences something to really scream about. An ‘ecstasy’ you’ve ‘never dreamed of before that ‘satisfies’ all ‘your base desires’, this one definitely isn’t for the Sunday churchgoer crowd. Savagely stimulating, erotically entertaining, and just pure naughty, naughty, naughty, this Rocky truly is from another world.